English or True Lavender is a scented perennial shrub growing to 2m tall and producing masses of mauve flowers. Dried flowers can be used as a culinary herb and are often added to herbes de Provence mixes. Flowers attract bees and hoverflies. Scent repels moths. 14-20 months to flowering. 150 seeds per packet. English Lavender despite its name isn't actually native to England but instead originates from the Mediterranean. Lavandula angustifolia is called English Lavender because it was grown extensively in England during the 18th century for its scented oil which was extracted from the flowers and used in the perfume industry. The French perfume industry on the other hand preferred the scent of the oil from a different species of Lavender, Lavandula stoechas, which similarly became known by the common name of French Lavender. English Lavender is a flowering perennial shrub with showy mauve flowers that makes a colourful additional to boarders, rockeries and drier spots in the garden. The dried flowers of English Lavender are edible and are sometimes mixed into French herbes de Provence blends in addition to marjoram, thyme, savory, oregano and sage. Dried flowers can be used to add fragrance to potpourri mixes and homemade soaps. Dried flower buds collected just before they open have the strongest scent. Dry Lavender in a dry, sheltered and sunny spot to prevent the stems from becoming moldy. Dried Lavender sprigs can also be hung in clothes cupboards to repel clothes moths. English Lavender is an excellent companion plant for silverbeets, onions, lettuces, brassicas, tomatoes and squashes. The strong scent of Lavender will help to confuse insect pests that would otherwise feed on these plants. Planting English Lavender around apple and pear trees can help to repel codling moth. 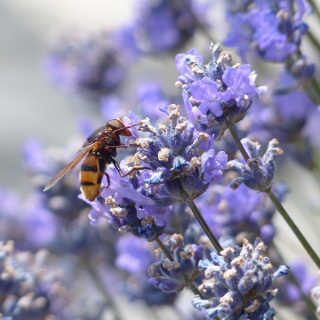 English Lavender flowers help to attract beneficial insects to your vegetable patch and are a favourite nectar source of bees and hoverflies, the larvae of which feed on aphids. Grow Lavender in a location with a full sun aspect otherwise it'll become leggy and bend towards the sunlight. Ensure your soil is free draining prior to planting, sandy loams are best for growing English Lavender. Consider growing lavender in raised beds with imported soil if your natural soil is too compacted or heavy with clay. Dig lots of organic matter including well-rotted animal manures, compost and worm castings through your beds prior to planting to improve your soil structure and give your young English Lavender plants all the nutrients they need to grow. Once established Lavender isn't a heavy feeder and will only need occasional fertilising with an organic fertiliser once a year in early Spring or more frequently if nutrient deficiencies appear. Lavender requires only occasional watering once established, prolonged dampness can actually cause root rot so water sparingly. Lavender is drought tolerant and suitable for xeriscaping. Prune back your English Lavender bushes by about a third after flowering so that they maintain a compact shape and remove any old, woody dead branches as your plants age. Old plants that have become too large can be divided during Autumn. English Lavender grows best with a neutral to slightly alkaline soil pH between 6.5 and 8.2. Sow English Lavender from September to November or from February to April in cooler regions of Australia. Sow English Lavender from August to November or from February to May in temperate regions of Australia. Sow English Lavender from August to October or from March to May in subtropical regions of Australia. Growing English Lavender in the tropics can be a challenge as the dampness will reduce its lifespan, but you can try growing it as a short lived perennial by sowing the seeds during the dry season from May to July. English Lavender seeds require sunlight to germinate so surface sow them and cover them only lightly with soil, a few millimeters deep at most, to prevent them drying out too much. Space Lavender plantings about 40cm apart to give them plenty of room to grow. English Lavender seeds can be slow to germinate, taking between 11 and 28 days for the seedlings to emerge. English Lavender takes between 14 and 20 months to start flowering consistently.